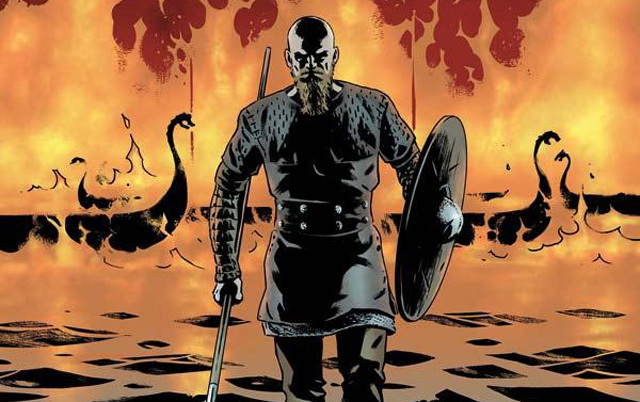 VIKINGS #4 Review @comicstitan | Warped Factor - Words in the Key of Geek. It’s all good fun till the gods get involved. Gods have been useful since the dawn of civilisation. They’ve allowed us to get things done, while believing we’d settled the fundamental questions of ‘Why Stuff Happened.’ They’ve inspired us to follow moral pathways, to imagine great works of art, to at least begin to build an understanding of natural science and human philosophy. Let us never doubt that gods have had many positive influences on our societies. We’re in 2016 and, while there are many, many groovy believers on the planet, we still haven’t entirely worked out how to successfully combine a strong deistic faith with other people’s beliefs and actions, let alone with verifiable scientific realities across the board. 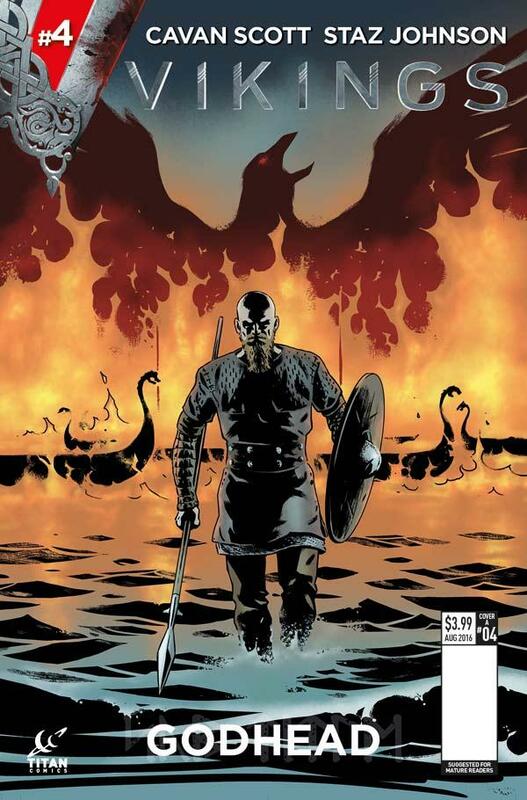 Ragnar Lothbrok, leader of a Viking band aiming to develop settling rights in 8th century Wessex, has many, many headaches in issue #4 of the Vikings comic-book – and the gods are behind a lot of them. As a Viking, he’s a believer in the Norse pantheon. But as in any faith, there are believers, and then there are Believers, and among Ragnar’s band, there’s his genius shipwright and advisor Floki, who distrusts the Wessexmen for their faith in their dead saviour, the Christ-god. More and more on their recent trip to negotiate with King Ecbert of Wessex, Floki has found the strains of dealing with the Christians, and the lengths to which his king is prepared to go to please them, deeply distasteful. Having outwitted and defeated a fellow Norseman by the name of Felman, who’s been raiding on the coasts of Wessex, the question is put among Ragnar’s band – now that they have him, what do they do with him? It might seem odd that this is a religious question, but when your gods demand that a Viking must die with a sword in his hand to enter Valhalla, things get complicated. Floki’s all for killing Felman ‘honourably’ but Ragnar has other plans – to expose the double-dealing aristocrats in King Ecbert’s court who thought to murder Ragnar’s band, Felman must be brought back to court alive. Meanwhile, back home in Kattegat, the gods are equally at play – failed harvests and hungry bellies must have some supernatural cause, and Jaska, a young woman from outside the town was originally blamed, by way of being a ‘witch,’ – for which read ‘stranger.’ Having survived trial by ordeal though, Jaska’s innocence was proven – which is all the security she needs to become a poisonous whisperer in the court, as Aslaug, Ragnar’s wife, tries to hold things together until his return. Jaska has her own ideas about what has caused the gods’ displeasure, blaming Ragnar’s refusal to kill his son Ivar, born with a disability and known to history as Ivar the Boneless. Such weakness, clearly, has angered the gods and turned them against Ragnar’s people, leaving Jaska determined to kill the child and restore their favour. (Before this is decried as barbaric, it’s worth remembering that the Good Book of the Christians, both in Wessex and everywhere today, includes the story of a man whose willingness to slaughter his own, perfectly healthy son on the instructions of a god apparently marked him out as someone worthy of being a builder of nations. Not saying. Just saying). On both fronts then, religion plagues Ragnar Lothbrok and his people in this final issue of the first Viking comic-book. Writer Cavan Scott gives us two separate solutions. In Wessex, the use of cunning allows him to satisfy the needs both of the secular world, proving the treachery in King Ecbert’s court, then pleading for mercy on behalf of the traitors, impressing the Wessexmen with his fairness, and the needs of Floki and his own religious observances, with plans made, traps sprung and Vikings allowed into Valhalla after all. In Kattegat, when Jaska decides to take the fate of the kingdom into her own hands, recruiting Siggy to her cause, she finds out that sometimes, the only way to avert religiously-fuelled tragedy is to implement a more…shall we say, Glaswegian policy, before subjecting the would-be saviours to the full force of the law. Scott shows us both the hoops through which people will jump to appease their secular constituents and their supernatural masters, and the need for sanctions against those too certain they have the blessings of the gods on their violent acts. Staz Johnson’s artwork continues to show us the roughness, the hardness of Viking life in his use of almost sketchlike lines and textures, giving each of the characters very vivid personalities in their faces and body language, and using a great mixture of ‘shots’ to mimic a directorial style that takes us quickly through the storytelling. It makes for a hard world full of individuals and complex dilemmas which easily relate to our own 21st century world, and supports Scott’s take on the TV show. The words and pictures together deliver the kind of pacing you’d expect both from a major drama and from a thrilling short run comic-book, an appetite-whetter hopefully for more to come, and for the show in case you haven’t seen it yet. The first Vikings comic-book story has shown us a range of characters, and made us want to spend much more time with them, engaging with the issues Ragnar faces at home and abroad as he tries to use his sword-arm and his brain to win a better future for his people. Issue #4 is a fitting capstone to the story, with its duality of story-thread and resolution, and makes us hope that future Vikings comic-books by Scott and Johnson will be just around the headland.